You can never know what an experience will be like until you have it. 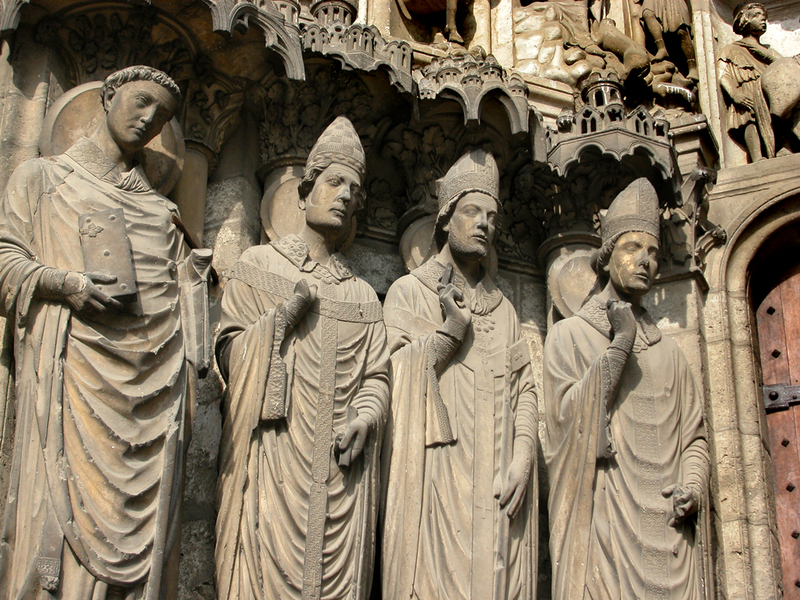 You can read about Chartres and see the photos. And you can visit other cathedrals, as we have on this trip. But you have to be there, at Chartres to see how it is different. This is not a panegyric to Chartres. Others have written them. My reaction is a bit different. I was surprised to see how sparse the cathedral is. After Notre Dame de Paris, I was expecting something a little more crenelated, more decked out, more flamboyant. After all, Notre Dame de Paris was an early example of Gothic architecture. 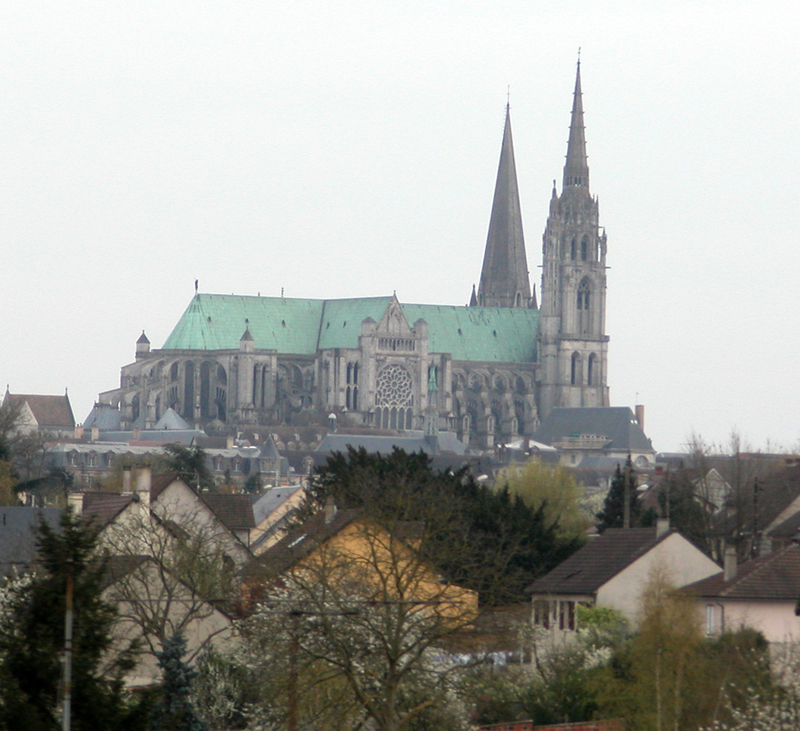 Chartres is considered High Gothic. It was followed by Rayonnant and Flamboyant styles, each increasingly geegawed up. 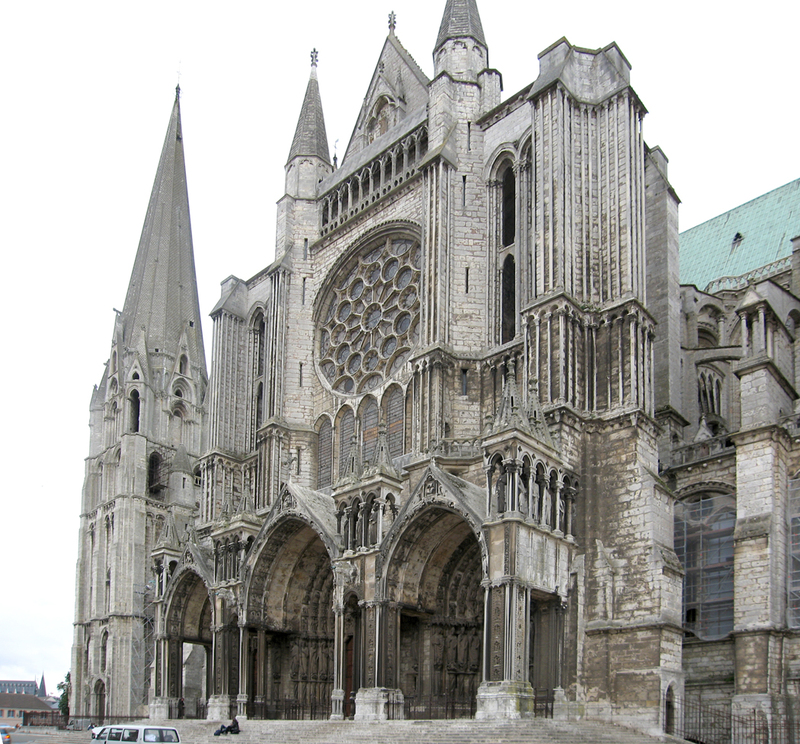 But Chartres is a veritable Spartan of cathedrals. Her west facade, for instance, is spare in the extreme, with only a few decorations, not counting the portals and their sculpture. But those portals are rather small and restrained, unlike their cousins in Paris. You almost get the idea of a facade that isn’t finished, that is waiting for someone to come along and add the finials, Hebrew kings, garlands of trefoils and quatrefoils. Instead, it almost looks like the Gothic cathedral equivalent of plywood. Because this was our first acquaintance with Chartres, we took a rather methodical approach to the building. We walked first around the building, from the facade to the south porch, around the apse and treasury, along the north porch and back to the front, making the full circuit. Yes, the portals of the transepts are splendid, rich with sculpture. 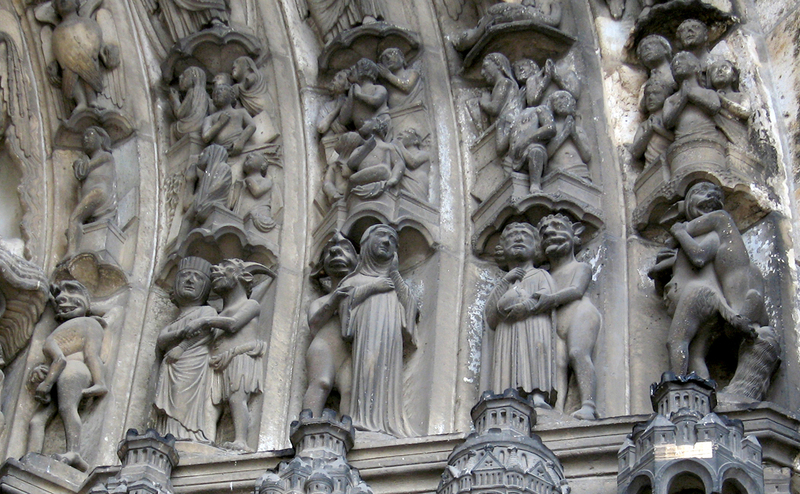 The bulk of the statuary can be found on the transept porches, and some of it is extravagant. But otherwise, the walls of the building are generally plain. And when we went inside, we were blinded by the dark. It is a dimly lit nave — again contrasting with the brightness of Paris, to say nothing of Sainte-Chapelle. The proportions of the nave seem almost primitive. 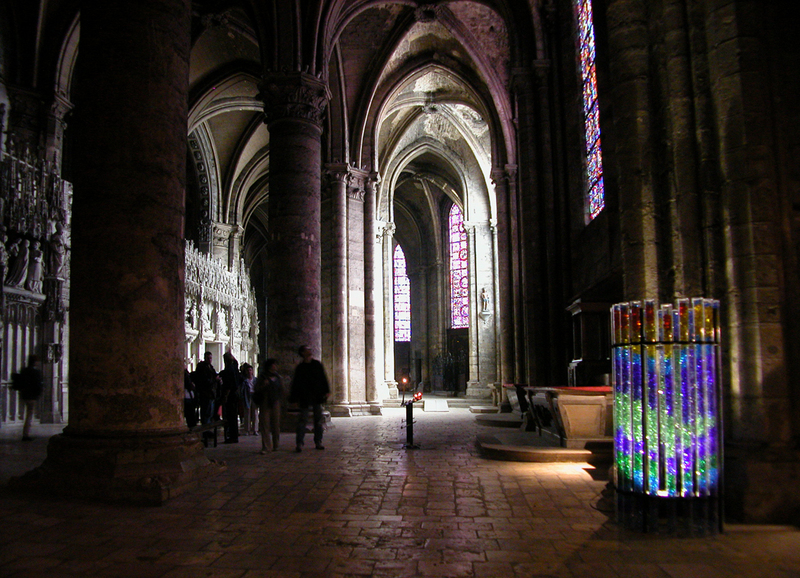 The classic Gothic nave walls consist of three layers: an arcade between the nave and the aisles on either side of it; a second-story, called the triforium, which is another arcade piled on top of the first; and finally a wall of windows, called the clerestory, which lets the light into the building. At Chartres, the proportions are different from in most of the other cathedrals we visited. The large aisle arcades take up almost half the height of the nave. The small triforium leaves room for a rather scaled down clerestory. The result of these odd proportions is that not much light drifts down to the nave floor. It takes quite a while for your eyes to adjust. When they do, there is a good deal of wear to be seen. Not only is the stone floor worn wobbly from centuries of traffic, but the vaulting in places is peeled or exfoliated, showing some brickwork behind the stone. In far corners, walking through Chartres feels almost like spelunking. 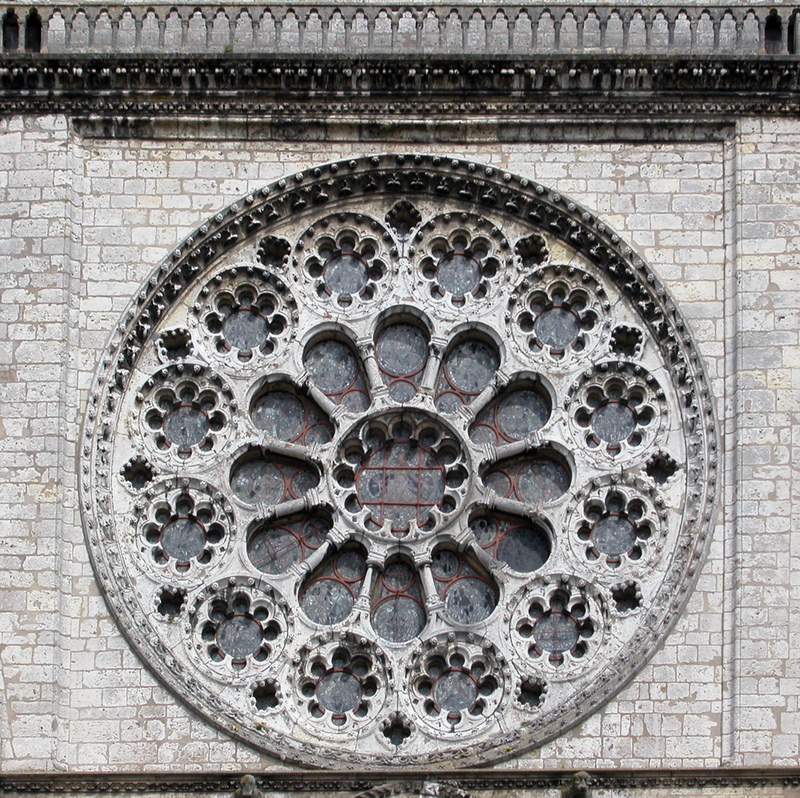 The rose windows are also smaller in proportion to their settings than those of Paris. 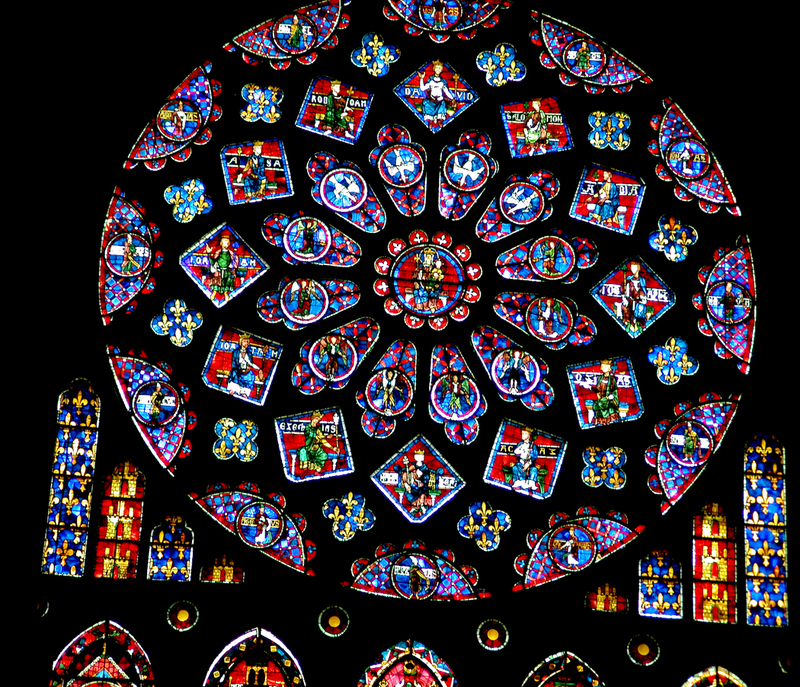 The west rose window, in particular, is at least half stone. The tracery is heavy and dense, leaving only small patches of glass to shine. Unlike the Paris rose windows, this one seems almost a crude, early attempt at constructing one. The north and south rose windows are more elaborate, but even they are small in comparison with the space of the transept walls. They could easily have been made 20 percent or 30 percent larger without overwhelming their setting. The interior almost gives you the feeling of an empty apartment, after someone has moved out. Where are the paintings, the furniture, the curtains? 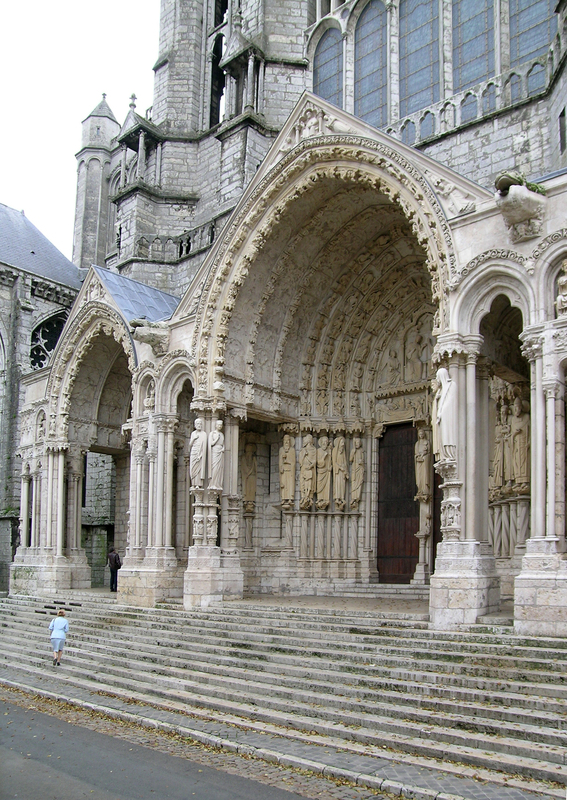 In Chartres, where are the windows, the interior carving, the elaborate bosses in the vaulting? Of course, we didn’t see Chartres in operation, as we did Paris. Perhaps it has the same awe inspiring grandeur when a mass is being said. And you cannot fault its setting, on the hill above the town. From miles around, you can see the twin towers looming. It was the first thing we could see from the train arriving in the morning: Those towers poking up out of the countryside. I walked the eleventy-hundred stairs up the north tower and dangled acrophobically over the roof, the bell and the south tower, taking photos of gargoyles, tracery and stone foliage. Liability laws must be quite different in France. In the U.S., they would never allow anyone to climb up those stairs, let alone hang out over the precipitous drop, with its low balustrades and that steady breeze that must often become a wind. 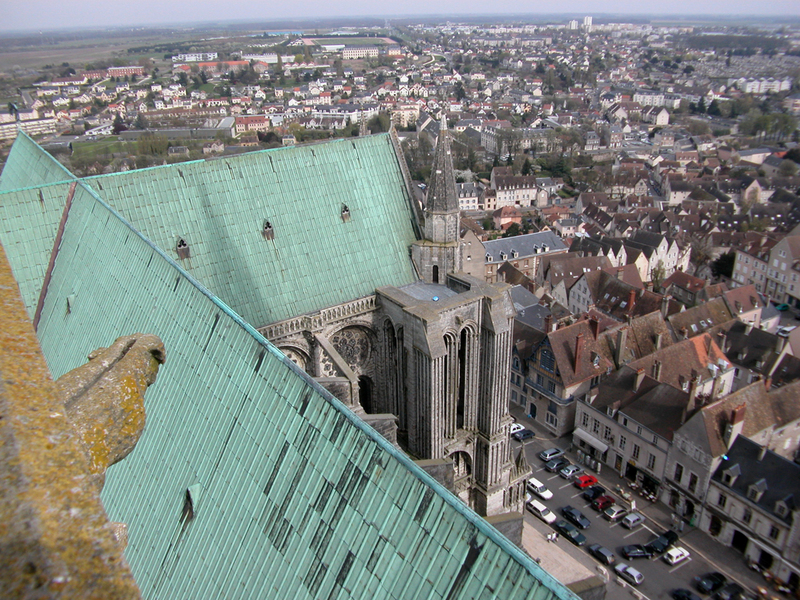 One of the reasons Chartres is so highly prized is because so much of it is original. The statuary at Paris is cleaner and more neatly featured. But then, it is only 150 years old, having been restored by Viollet-le-Duc in the 19th century. Viollet-le-Duc was a magnificent man, and his restoration work at Paris is convincingly original looking. You don’t sense much of the 19th century in it. But it is still pristine. 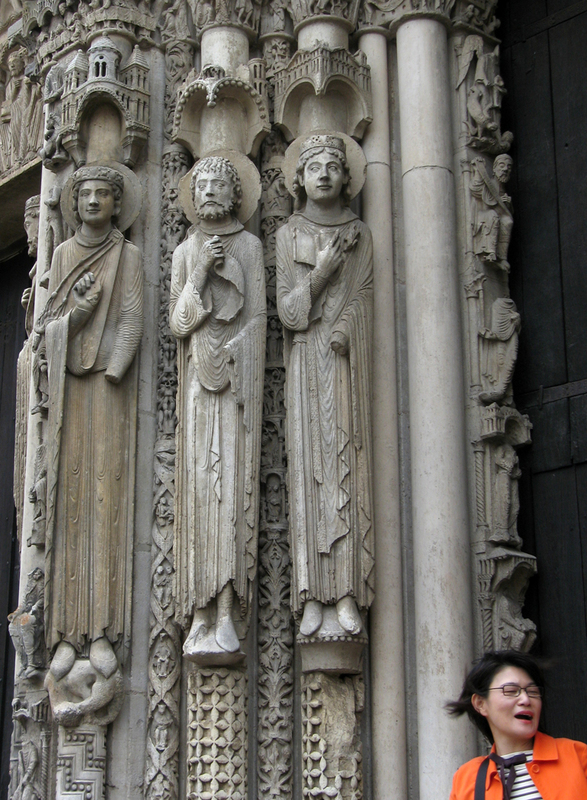 At Chartres, the statuary is weathered. You can see the lichen growing on the stone. Even the walls of the cathedral sport tufts of daisies high up, in unlikely places, growing straight out of the masonry. The limestone is mossy, lichened and eroded. Paris has only recently been sandblasted. Its stone seems newer — although there is plenty of erosion to go around there, too. But Viollet-le-Duc’s restoration has made Paris look fresher than her matronly cousin in Chartres. Don’t get me wrong. I don’t mean to pooh-pooh Chartres. It has its glories. And it is the very prototype of the high Gothic. 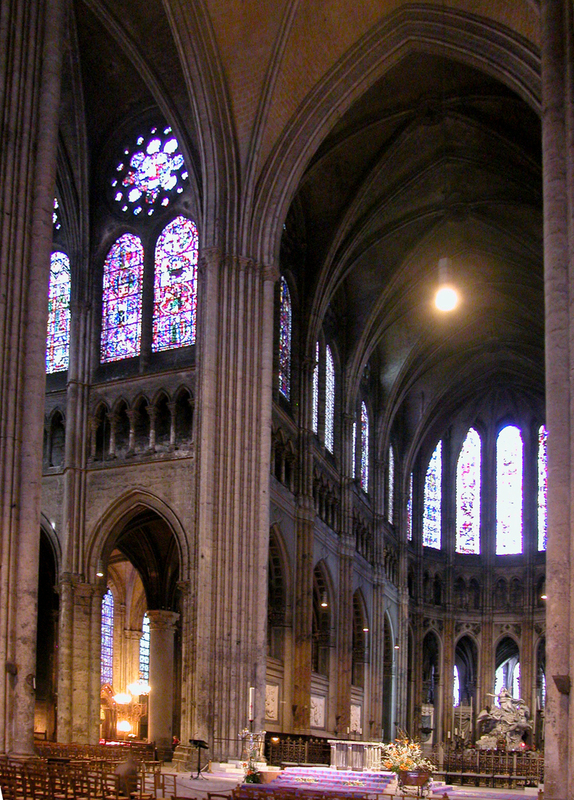 But there was a certain musty odor in the nave; Paris smelled more urban, more used. If I sound disappointed, I don’t mean to. We spent a good 9 hours with Our Lady of Chartres. We spent that time feverishly. I photographed every one of the main sculptures of the portals, and a good deal else beside. 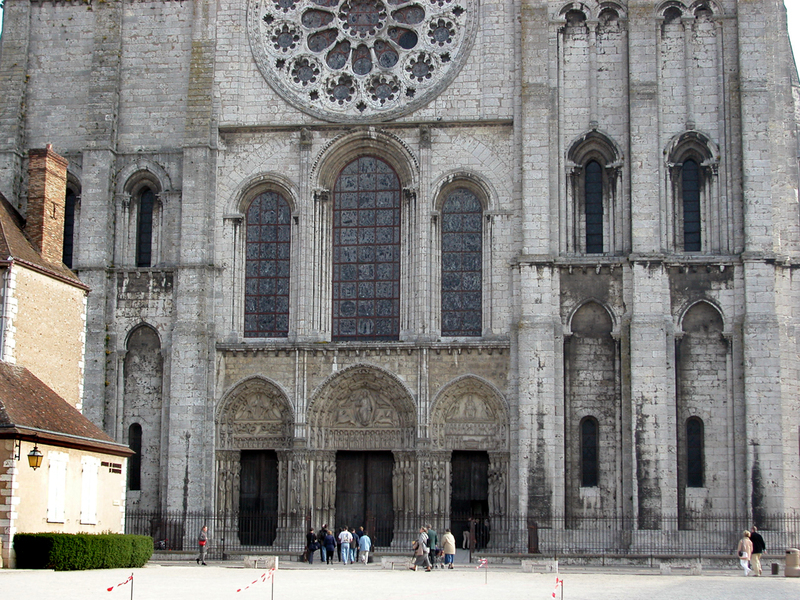 If Chartres seemed dimmer than we had expected, the problem was with our expectations. 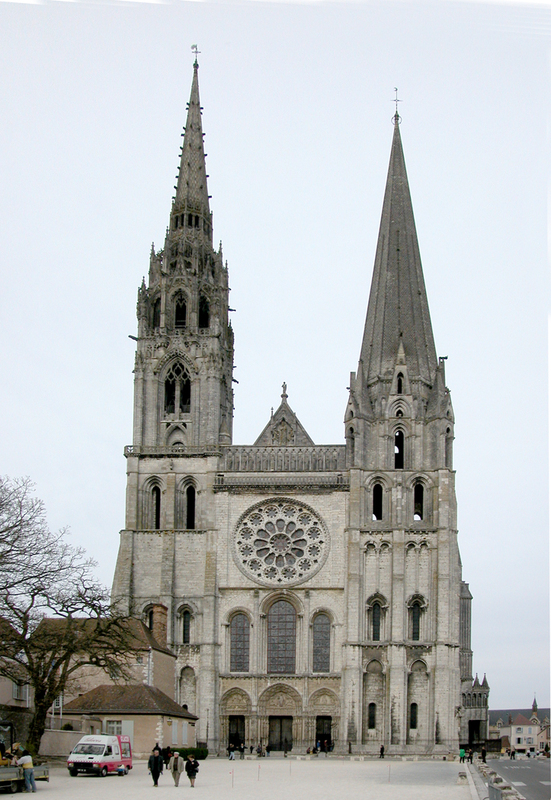 Chartres has since drawn us back several times, and each time, it has revealed more and more of itself, and now I see it as the archetype of the cathedral, the mother building, the pure form. Other churches may be more tarted up, but there is a dignity at Chartres, a refusal to take on the shallow and transient, that makes it more classic. 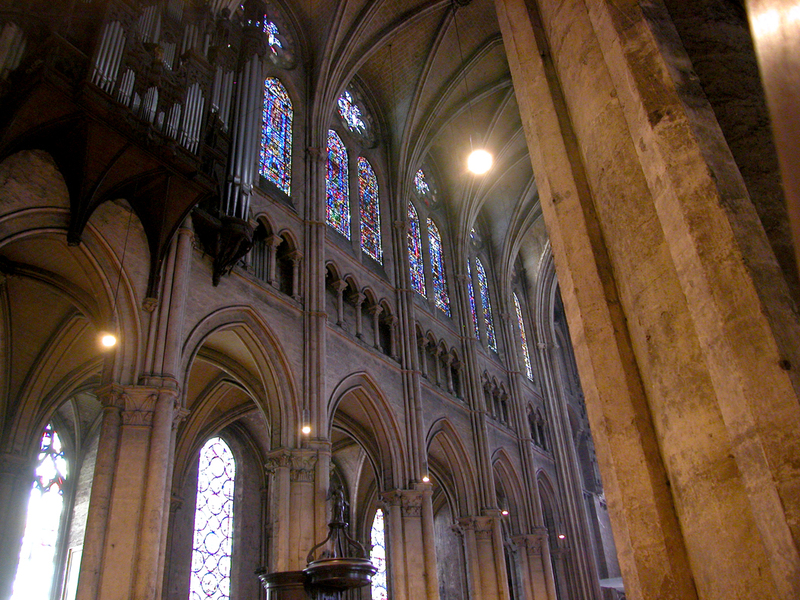 I have come to love Chartres, and especially its glorious rose windows, those burning embers glowing through the walls. We have gone to Notre Dame de Paris more often — because it is in Paris, and therefore available each time we visit France — and we love the cathedral in Paris very dearly, but there is in me, at least, a special reverence for Chartres, that draws us back, no matter how far out of the way we must go as we drive around the hexagon that is France. From every corner of the country, we somehow are pulled by the gravity of Chartres back to absorb its special aura, power and spirit yet one more time. And I say that as a committed atheist. 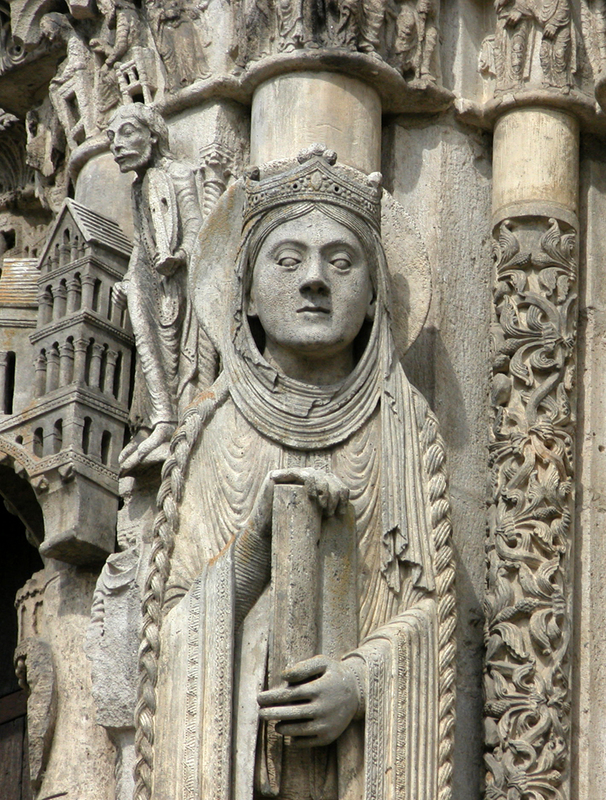 I can remember the art history courses from college, and the long, boring lectures about the Romanesque and the Gothic, and taking it all in, looking at many fuzzy slides of Chartres projected on the screen at the front of the lecture hall. And the many photographs from books, including the great Mont-Saint-Michel and Chartres by Henry Adams. Pictures in picture books are one thing. The palpable feeling on the skin of the humidity in the vast interior space of Chartres, the light hitting the floor, the smell of centuries of stone — the reality grabs you by the hair on the back of your neck and has not let go yet. Now we have experienced it, have it in our blood. This is a panegyric to Chartres.